Sega Flash Vol. 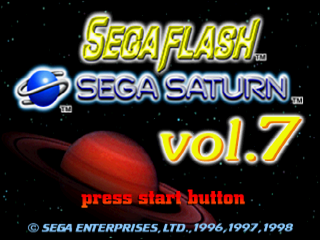 7 is the seventh and final demo disc in the Sega Flash series. It was released in 1998. Vol. 7 contains three playable demos, although Steep Slope Sliders and Sega Touring Car Championship are recycled from Sega Flash Vol. 6, with Sega Worldwide Soccer '98: Club Edition being substituted for World League Soccer. In the United Kingdom this was released with issue #32 of Sega Saturn Magazine.